A must-read for anyone looking to improve their gut health. 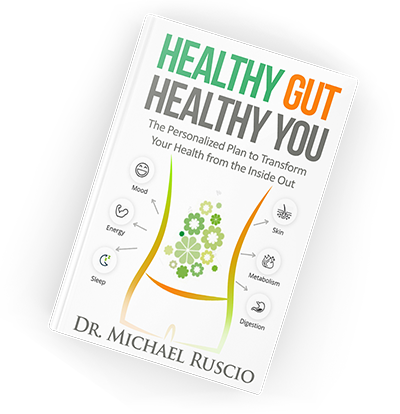 I have studied gut health for nearly 20 years and have encountered few people with the level of knowledge on this topic that Dr. Ruscio possesses. Interestingly, his knowledge is not confined merely to research concepts, nor a purely clinical understanding. Dr. Ruscio is unique in that his knowledge and experience are at the highest level of both theory and practical application of improving gut health. His book is a must-read for anyone looking to improve their gut health. 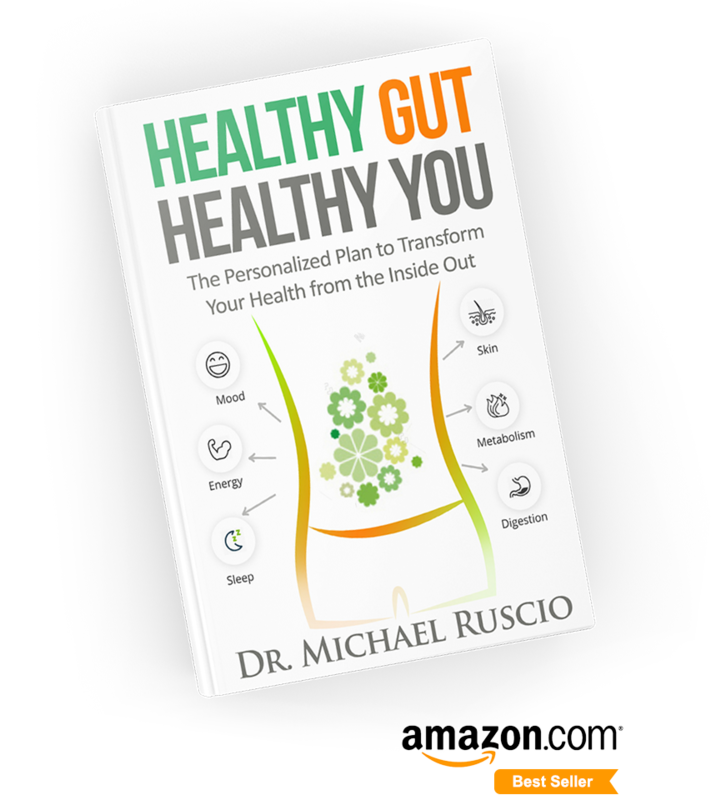 Dr. Ruscio’s book is THE authority to learn about and heal your gut. Hi, this is Dr. Ruscio, and I’d like to explain why my new book, Healthy Gut, Healthy You, can help you vastly improve your health. This dilemma is worsened because the proposed solutions are often dogmatic: avoid gluten completely, no carbs, handfuls of supplements, or what have you…. This creates plans that are hard to follow AND expensive. So what do you do? What is the fastest and easiest way to feel better? You start with your gut. Fixing a problem in the gut often addresses the root cause of your symptoms… symptoms like fatigue, depression, anxiety, joint pain, sleep difficulties, skin issues, and weight gain. Because starting with the gut addresses the cause of many health ailments, you end up doing less, but achieving more. Less dietary changes, less supplements, but with more improvements in how you feel. This is why I am so excited about my new book, Healthy Gut, Healthy You. In this book, all of the important information regarding your gut health is first translated into an interesting storyline. Then, at the end of the book, I organize everything we have learned into a step-by-step plan that is personalized to your needs so we can get you healthy. Because the plan is personalized, it’s efficient – you obtain maximal improvement with minimal effort. By going through this step-by-step plan, we will work together to determine what diet is best for you and what supplements you should use, in what sequence, and for how long. “From someone who has been on a personal journey to regaining their health and who has lost countless nights of sleep flip-flopping from one guru-approach to the next… this is the most comprehensive piece of literature I have been exposed to that truly dissects the variables that lead to optimal gut health.” — Ryan C.
I highly recommend Dr. Ruscio’s book for both the suffering patient and clinicians looking to sharpen their skills. Dr. Ruscio is a leader in our field of functional medicine. He has always impressed me with his science-based approach that also includes a practical application emphasis. I believe highly skilled clinicians who have strong evidence-based backgrounds are what our profession needs to advance and take its rightful place as a leading option for sick patients; Dr. Ruscio delivers in this regard. I would highly recommend his book for both the suffering patient and the clinician looking to sharpen their skills. Those helped by his book are living proof of Dr. Ruscio’s exemplary approach. I have enjoyed the support, guidance, and inspiration of a short list of thought leaders in the holistic health space. Dr. Michael Ruscio is on this list and is an exemplary model of a rare clinician who can effectively translate cutting-edge science into clinical efficacy. His book and those it has helped are living proof of his deep understanding of systems biology and specifically an advanced approach to the ancient practice of starting with the gut. “This books has given me many answers and guidance to help myself and all the people I work with to create better health more resilience and balance in their lives. “ — Alon D.
How? By treating the root cause – your gut! Are you searching for the best gut-health protocols? Healthy Gut, Healthy You lays out all the specific protocols needed to heal your gut. However, have you ever noticed what works for someone else didn’t work for you? That is because no two people are the same. Because of this, it’s more important to have a program that personalizes the protocols to your needs. In the book’s self-help program, we will re-assess, step-by-step, and modify the protocols to continually fit your needs. There is no magic pill, diet, or dose, but you can obtain miraculous results if we personalize sound protocols to fit your needs. This book is what I feel to be the most scientifically and clinically accurate, and up-to-date, book available on gut health today. It tells the story not only of my clinical experience, but that of nearly 1,000 scientific references that have evolved our understanding of how the gut works and how we can repair it. These references are not merely footnotes that were farmed up from animal and petri dish studies to reinforce what I believe. These studies have shaped my clinical practice and guided this book. The majority of the studies are clinical trial data or higher. This section will summarize what the evidence shows for diets like low carb diets, the paleo diet, and the low FODMAP diet. It will also summarize the evidence regarding probiotics, adrenal support, digestive enzymes, herbal antimicrobials, and more. It will provide a no-nonsense summary of what these tools can and cannot do. It will also help you understand common imbalances in the gut like SIBO, fungus, candida, and H. pylori, amongst others, and more importantly, what you can do about it. This book is written to empower and help you, the reader, providing a personalized step-by-step process to improve your health that is not dependent upon elaborate diets or excessive supplement programs and providing practical solutions that are also cost-effective. If you are not well, the first step should be optimizing your gut health. This is because the hidden cause of many symptoms, including non-digestive symptoms like fatigue and depression, is an unhealthy gut. It’s not a guarantee, but it’s usually the best place to start. You will not finish this book being afraid of food or indoctrinated into thinking you must take supplements for the rest of your life. You will feel educated and empowered. You will have a step-by-step protocol to follow, helping you first determine how you should eat, then, if diet has not provided adequate relief, how to use the other available tools, like probiotics and herbal medicines, to heal and repair your gut. You will be provided with the exact foods to eat, the exact supplements to take, with exact doses, for how long, and finally how to eventually have a broad and open diet, while also being on little to no supplements in the long term. Hi, I’m Dr. Michael Ruscio. I am a doctor, researcher, author, and health enthusiast. I practice Functional Medicine with an emphasis on natural and nutritional solutions. I give smart, busy people who are suffering from symptoms of chronic illness simple steps to get better, and get on with life. After years of an active life as a healthy athlete, I suddenly found I was tired, depressed, and my digestion was off. I couldn’t sleep at night. My hair was thinning and I had no libido. I needed multiple naps to get through a day and experienced brain fog from eating almost anything. I was feeling depressed and woke up at 3 a.m. with insomnia only remedied by chocolate. I went to a few doctors and, disappointingly, all my lab tests came back normal. I was told there was nothing wrong with me, but I knew something was very wrong. I read everything I could on the internet and proceeded to waste a ton of money on herbs, vitamins, and supplements in attempts at treating my symptoms. I eventually found Functional Medicine and figured out that a gut infection was at the root of all my problems. I learned how to heal my gut, re-balance my hormones, and get my health back. After reading this book and going through the self-help plan, you can expect to feel vastly better because you have addressed the root cause of your symptoms, your gut. Equally as important, you will feel empowered, educated, and confident in the plan that we, together, have crafted for you. The most important step you can take in optimizing your health is improving the health of your gut. I look forward to guiding you through this process and witnessing the remarkable improvements this plan can produce. “Thanks to this book, I dropped 2 pants sizes, eliminated bloating after each meal, and have tons of energy all day long! “ — Sean O.